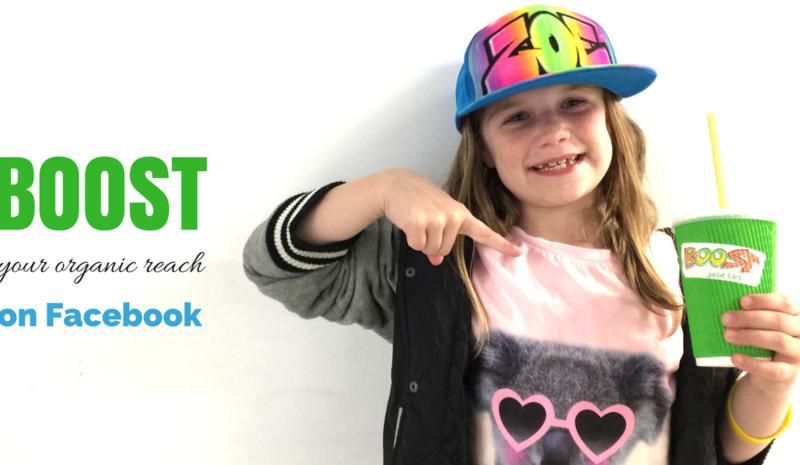 Yes, you can strategically invest in Facebook Advertising to help circumnavigate the Facebook algorithm that is limiting your reach, or you could get more creative and pay nothing for increased engagement, reach and sales, in a similar fashion to what Boost Juice has done. How do you get more reach on Facebook without paying for Facebook Ads? The key to getting more organic reach on Facebook is to get more engagement. The more people viewing, clicking, liking, commenting, tagging friends and sharing your content, the more reach you will get for it. So if you want more people to see your content, then you need to be posting content that is engagement worthy. This is what Boost Juice is doing. One of the main factors that makes your content engagement worthy is it’s perceived value. Content that entertains, educates or inspires can be perceived as valuable. Offering something that has an actual monetary value is also engagement worthy. After all, who doesn’t love free stuff? 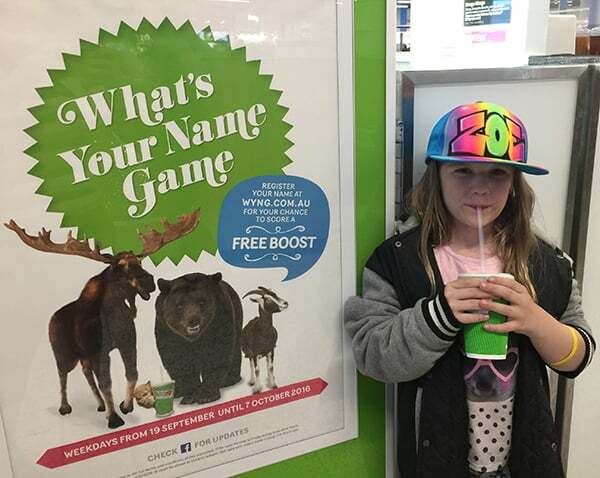 Boost Juice has a What’s Your Name Game promotion that it runs every day of the year. Every evening at 6:30pm, they announce on their Facebook Page the three lucky names that will be able to get a free Boost Juice the following day. They then announce this again the next day on the morning of eligibility at 7am. These two posts give sufficient time for people to recognise either their own name or a name of a friend. This results in a lot of liking, commenting, tagging of friends and post sharing. It’s usual for these posts to generate thousands of reactions, tens of thousands of comments (mostly people tagging their friends) and multiple thousands of shares (Including both public and private shares). These are incredibly impressive figures, even for a Page with 624,000+ Page Likes. This is a brilliant engagement strategy and one of the best parts of it is that this can be planned well in advanced, with the images and copy created in bulk and then scheduled to be posted every day, so there is fresh content going out each day with minimal daily effort. 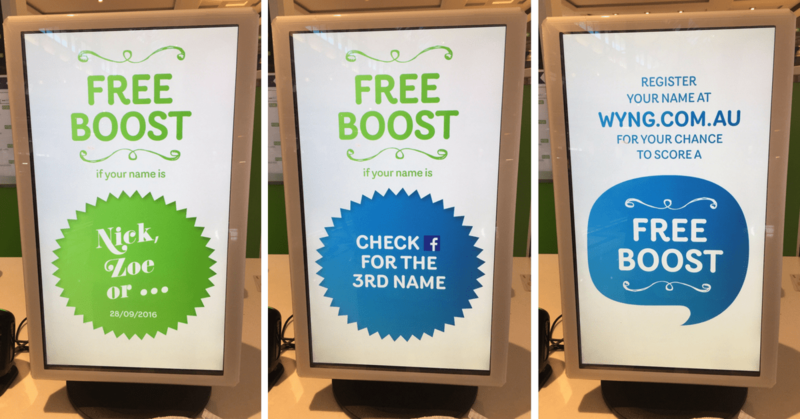 Boost Juice provides your with the opportunity to register your name to be eligible for the Name Day promotion. As part of this registration process you get the opportunity to opt-in to receive their email marketing. That’s a healthy list building strategy! Then when your name is called as a result of your entry they give you a shout out so that all the Marshall’s of the world can express their gratitude for your awesomeness. Cue, more liking (actually loving), commenting and sharing. You might think that is type of activity will cost Boost big time. Likely not! Firstly, there is likely a fair bit of profit margin in their product for Boost Juice to be able to give away a decent amount of product without it sending them into the red. A good portion of the Nick’s, Zoe’s and Marshall’s of this world are likely to be visiting the store on their Name Day only because it’s their special day. There is likely to be some secondary spend from them whilst there and many of them will probably drag along their friend’s and family, who will likely purchase whilst there also. In addition to this, many of the people that visit the store when their name is called will do so for the first time. Boost Juice is in effect providing them with a free sample in an attempt to hook them to come back from more of their product at a later date. Some people pay promotional companies thousands of dollars to coordinate this type of marketing at high traffic areas. Boost Juice is doing this for free with the help of organic activity on Facebook. Plus, they are also getting the people into their store to experience the environment or “Vibe” as they like to call it. No doubt there is also a fair bit of social sharing from people once they get their free Boost. It’s not just in-store traffic that Boost Juice is pushing for either. They clearly appreciate the value of creating engagement on Facebook and are using the in-store experience to drive more traffic to their Facebook Page. They do this by only announcing two of the three names as part of their in-store What’s Your Name Game promotions. So if you visit the store and are unaware whether or not today is your lucky day, you are encouraged to visit the Boost Juice Facebook Page to find out. It is likely that they generate quite a few Page Likes from their customers who undertake that action whilst waiting for their Juice to be made. That’s more people that will potentially see future Name Day promotions and engage with that content. Can you see how this is all coming together as a never ending juicy strategy of goodness? What can you do to generate more engagement on your Facebook Page? Have you implemented a similar strategy to Boost Juice that has allowed you to generate a high level of engagement around the content that you are posting to Facebook for your business? If so, share the details in the comments below so that we can learn from you also. Wow what a fabulous promotion. I like Boost Juice and will keep an eye out for my name day now!